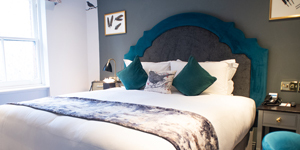 The Blackbird, a popular Fuller’s Ale and Pie pub in Earl’s Court, opened nine beautiful boutique hotel rooms on 21 January, providing the perfect base for exploring London. Fuller’s operates 35 boutique hotels and inns across England, each with a classic British pub at its heart. The Blackbird is the latest pub to join this list. Previously a branch of The Midland Bank, The Blackbird was converted into a Fuller's Ale & Pie house in 1994. Its grand and traditional interior has made it a popular spot for drinks and tasty English pies, and now is able to accommodate guests overnight in one of their nine beautiful bedrooms. The boutique rooms each carry the theme of The Blackbird, with luxurious comforts including 1800 pocket sprung mattresses, the finest Egyptian cotton linen, Nespresso machines, unlimited ultra-fast Wi-Fi and delicious breakfasts. The area of Earl’s Court itself that surrounds The Blackbird is a starting base for many visitors to London, due to being within walking distance to major tourist attractions including Kensington Palace, Hyde Park and The Royal Albert Hall. More close-by attractions include The Natural History Museum, The Science Museum and Stamford Bridge, home of Chelsea Football Club. Earl’s Court tube station is also a short walk away. Here’s a taste of what you will find when you stay at the new boutique hotel rooms at The Blackbird in Earl’s Court, which is now open and taking bookings! Be among the first to stay in the newest boutique hotel in Earl’s Court, by booking a room at The Blackbird. Visit The Blackbird’s website for more information and to make a booking.